Pike Research is boldly predicting an explosion of clean diesel vehicle sales, to make more than 12% of the global light-duty vehicle market by 2018 and to outpace hybrid sales in North America. This latest report from Pike Research finds that rising fuel prices and stronger fuel economy regulations will stimulate higher demand for clean diesel vehicles in world markets. The report predicts that an estimated 9.1 million unit sales in 2012 will increase to 12.1 million annual diesel vehicle sales by 2018 and make up 12.4% of all light-duty vehicle (LDV) sales by that time. 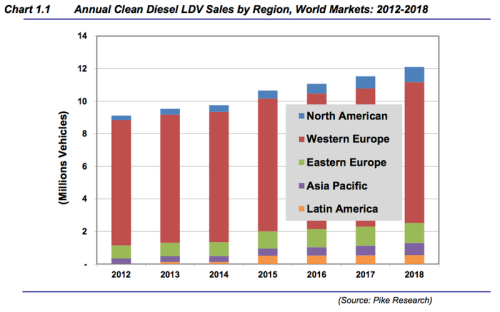 Although North America has been a weak market for diesel in the past 20 years, Pike sees an upsurge in acceptance and purchase of clean diesel in the LDV market here due to stronger fuel economy regulations; and in 2010 and 2011, diesel sales showed strong growth in the consumer market while hybrid sales dropped. From 2012 to 2018, Pike forecasts that North America will experience a cumulative diesel growth rate of 22%, reaching annual sales of just under 1 million LDVs, with the U.S. leading Canada. Pike expects annual clean diesel sales volumes in this region to increase from 282,000 vehicles in 2012 to 928,000 by 2018. Between 2012 and 2018, diesels will capture a slightly higher percentage of new vehicle sales as hybrids, although both will remain niche drivetrains, according to Pike. Globally, PIke's predictions say clean diesel LDV sales will grow at a cumulative annual growth rate of about 4.8%, with the majority of sales continuing to be in Western Europe where they've traditionally been strong. As a whole, however, most of the growth in clean diesel vehicle sales will be in markets outside of Europe, despite Western Europe still comprising about 50% of global clean diesel sales. Pike anticipates that medium- and heavy-duty vehicles will see market share erosion as alternatives to diesel in these markets begin to gain footholds. While hybrids and plug-ins will be included, the majority of the market loss will be to natural gas vehicles, which are gaining market share at a faster pace than any other alternative. Fuel economy regulations and higher availability of these alternatives will be the main drivers of their adoption. Pike predicts a drop from a current 99% market share for diesel to 93% in North America and 91% in Western Europe.